In this chapter, the approximate analytical solutions of a new reaction-diffusion fractional time model are studied. 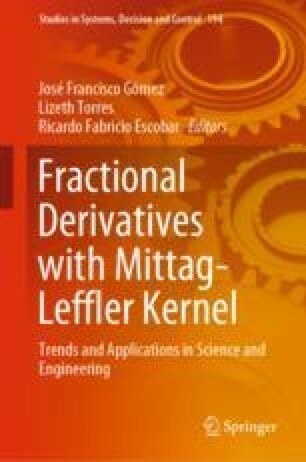 For this analysis is used the p-homotopy transform method based on different kernels (power, exponential and Mittag-Leffler). The system nonlinearities are addressed by the Adomian polynomials. The system convergence is studied by determining the interval of the convergence by \(\hbar \)-curves, as well as, searching for the optimal value of \(\hbar \) which minimize the residual error. Therefore, the optimal \(\hbar \) value is calculated to estimate the order \(\beta \) error. At the end of the chapter, we explained the obtained behavior by plotting the solutions in 3D. The results are accurate. José Francisco Gómez Aguilar acknowledges the support provided by CONACyT: Cátedras CONACyT para jóvenes investigadores 2014.